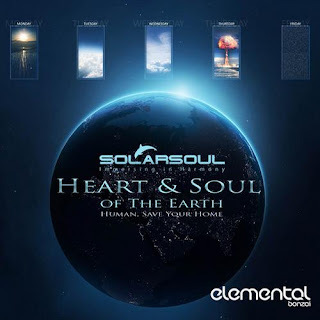 audiopraline: SOLARSOUL "HEART & SOUL OF THE EARTH"
Diversity of electronic music is probably one of its most pleasant features. But the most genial one is that a master artist can extract even the most heartbreaking and relaxing sounds from the synths. Sounds of a heart, of nature or summer night, interweaved in tracks. Like the one you can hear in the album Heart&Soul Of The Earth. This exceptional collection of chill out tracks created by Solarsoul can easily make you feel not only relaxed, but also humble and wise. It takes you to the basics where all true values can be found. The Intro, Heart&Soul Of The Earth and the Outro tracks are the top 3 peaks of this album. Fortunately the incredible journey doesnt fades with the last track of Heart&Soul Of The Earth. The masterpiece website of Solarsoul will take you to a great deal of chill out experiences enhanced with a breathtaking design.